At the start of the 2018/19 season U16s the furthest thing from the minds of the coaches was the thought of a playoff spot in the league let alone the final. Roll on six months and not alone was there a playoff spot but the Colts were in the final. Their opponents were Gort Gladiators. 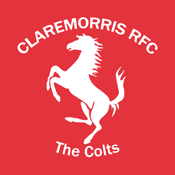 The earlier league meeting between these two sides saw a narrow victory for the Colts. Gort wanted to put that record straight, the Colts would have a lot to say in their attempt. On a very heavy, mucky wet sticky pitch in Tuam these two Titans of rugby meet on Sunday the 3rd February. Before the kick off the Colts got into a team huddle. Joined by the two team members injured in this campaign MJ Duffy (broken wrist) and Cathal “fingers” Heaney (broken leg) Colts captain Dermott Cawley laid out in no uncertain terms what he expected from his team. They duly obliged and did not disappoint. Gort kicked off and the safe hands of Colts full back Joe Prendergast gathered and started one of his now familiar bursts up the pitch. Ruck after ruck followed and thanks to the work of the forwards the Colts made huge metres into the Gort defense. Because of the wet slippery ball it was decided to do plenty of carries and gain territory. But the Gort defense stood firm and with a wet ball a knock on was inevitable. Gort’s turn to test the Colts defense. Sheer determination not to let Gort play showed when pressure from the Colts pack restricted Gort to playing in their own half and a knock on resulted in a scrum. Gort feeling a little bruised showed exactly what they were made of when they pushed the Colts of their own scrum but as Gort gathered, two big tackles first from Michael Hett then Jason Morley saw the Colts turn over the ball and in the powerful hands of tighthead Sean McHale saw the Colts eat up the ground. Fed out of the ruck by Hett to Kyle Leonard whose turn of pace saw the Colts charge on, a beautiful pop pass out to Jack Sheridan saw him skip around not one, not two but three Gort players before going to ground. Alas that last tackle would see the end of Jack’s participation in this final prematurely end at half time. Jack protected by MAN OF THE MATCH Jason Morley and support from Jack Gleeson and Jack Kennedy, enabled big Kieran Sullivan to come in and take the ball and drive for the Gort try line. Kieran tackled just short of the tryline placed the ball back perfectly and as ever the quick thinking Kyle Leonard picked and went over for the Colts opening try and the first score of the game.The conversion unfortunately came up short 5-0 Colts. That lead wasn’t to last long. From the resultant kick off the Gladiators pressed and saw the Colts knock on. From the scrum the Gort No9 fed the ball to their full back and exploiting the space left by the Colts on the right wing ran in Gort’s try. Conversion missed. 5-5. That would be the last time Gort would breech the Colts defence although they did go in at half time 8-5 up after the Colts were penalised for going in of their feet right in front of the posts. The second half saw Brian McWalters replace the injured Jack “Sherry” Sheridan. This half was much like the first. Loads of carries and tackles, not much work for the backs to do as the ground being so heavy under foot they were unable to get any running going. That however was about to change. Two pieces of individual brilliance by the Colts saw first Michael Hett spot acres of space down the right hand side of the Gort’s defence. A kick over the top saw the strong breeze carry the ball down the line, the second piece was the Eagle eyes of Kyle Leonard to go chase the kick and put the Gort full back under pressure, which he did. The Gort full back had 10 – 12 metres on Kyle but enshrining the never say die attitude of the rest of his team mates he never gave up the chase. Chasing the Gort full back all the way to the try line. With sheer will and determination Kyle slid in and beat the full back to the ball. The huge support in the stands from Claremorris were unsure as was the ref who raced over to see if indeed Kyle had touched down. After consultation with his linesman (good man Martin, all is forgiven with Connemara🤣🤣) the ref awarded the try. Unfortunately the Conversion was missed 10-8. With only six minutes remaining the Colts were awarded a penalty in front of the Gort posts and a shout from his coaches to kick the penalty, up stepped Joe Prendergast to tap over and put a 5point lead on the board.13-8. From the kick off Gort put huge pressure on the Colts defence. Wave after Wave of attacks came but the Colts repelled the attack every time. Again Gort attacked, again they were driven back by the Colts defence. Then with one minute left on the clock tragedy struck when the hugely influential scrum half for the Colts Michael Hett had to leave the field of play after a very heavy collision saw him unable to move for nearly 5min. He eventually got to his feet and was able to walk from the field assisted by medics to a thunderous applause from the Claremorris support and his team mates. Michael was replaced by Adam Gleeson. This moved Dermott to scrum half and Jason to flanker with Adam slotting in to his normal No5 role. Because Gort were attacking at the time of the stoppage they had the put in on the scrum in the Colts 22. More serious pressure was exacted on the Colts defence, again, like the Spartans they repelled every advance by Gort. Penalty Gort, tap and go, Repelled! penalty Gort, Repelled again! Gort went left then right but there was no way through the black wall of the Colts. A huge tackle from Brian McWalters saw Gort spill the ball back and the follow up by the Colts saw Gort penalised for holding on! A huge sigh of relief spread across the faces of the Colts players. The ref informed both sides that this was the final play. Kyle Leonard had the honour of closing out the game. He took his time and a deep breath, tapped the ball to himself and then booted the ball into the stands the ref blew the final whistle and this brought instant jubilant scenes on the pitch from both the players and coaches. The huge cheer from the traveling supporters was deafening. 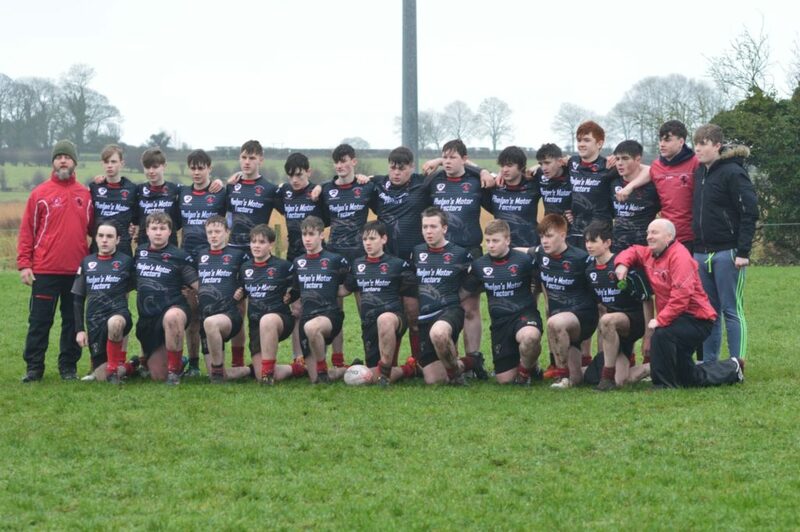 It was an epic battle in very trying conditions and both teams left everything on the pitch but the Claremorris Colts were worthy of their victory. Colts jubilant captain, Dermott Cawley, collected the trophy from Connacht RFU rep Padraigh Moran and held it aloft with his team mates to rapturous applause. A huge thanks must go the the time, dedication and commitment of the parents who without their participation would not have made this victory possible.